Come out to the Tree Patch** at Peabody's Farm and pick out that special Christmas centerpiece for your family's BEST CHRISTMAS ever! Tree patch will be open beginning "Green Friday," November 24th 9am-2pm and Saturday, November 25th 10-noon; ?then, Thursday evenings 6-8pm; Saturday mornings 10-noon; and during Family Fun Days Saturday, December 2 & 9 and Sunday December 9 & 10, noon-3pm until supplies last. All tree purchases come with complimentary hot chocolate or hot cider for the family members present! **(we prefer all purchases to be made in advance/online). LIMITED Tree types: the Blue Spruce, the needles of this tree have a lovely silver-blue color, though they are rather prickly. Blue Spruce holds its needles well and they generally have a good symmetrical form. The Fraser, doesn't drop its needles as quickly. It also has a more narrow base - making it ideal for tight spaces. 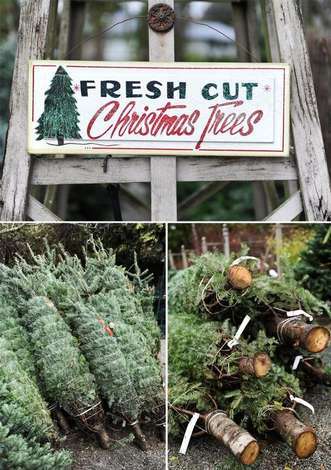 It's now the best selling Christmas tree in the US, and also has a lovely, aromatic fragrance. Douglas fir has soft, dark green or blue green needles. The tree is popular for its good needle retention and a lovely citrus fragrance.